One of the most endearing neighborhoods found on Royal Caribbean's Oasis-class cruise ships is the Boardwalk, which is reminiscent of the whimsical seaside resorts. Dedicated to family, fun and nostalgia, the Boardwalk neighborhood was inspired by both the seaside piers that dot the coast of England and the nostalgic boardwalks of yesteryear such as Coney Island. The Boardwalk is one of seven seven distinct "neighborhoods" that help break up an Oasis class ship. Located at the aft of the ship, the Boardwalk is a rather large area on the ship that offers lots of entertainment throughout the day and evening. The area is well known for the dining and entertainment options, as well as view of the ocean. Being at the rear of the ship, guests can catch a glimpse of the ocean, along with a show or something to eat. Boardwalk is an area for the entire family to enjoy together, whether young or just young at heart. The elements of the Boardwalk are a dynamic way to engage families in classic fun with a colorful original carousel as well as casual eateries, retail outlets and carnival games. There is plenty to see and do in the Boardwalk and here is a look at what you can look forward to on your next cruise. Royal Caribbean offers some terrific dining options in the Boardwalk, including restaurants and bars. The various restaurants in the Boardwalk are inviting choices for lunch or dinner. Johnny Rockets is open for breakfast (with no charge for breakfast), and as you stroll the Boardwalk, most of the options are perfect for dropping in for a bite to eat. The Boardwalk features some of the best dining choices aboard any Royal Caribbean ship. There are a number of staterooms that offer views of the Boardwalk neighborhood on Oasis-class ships, a feature that is unique to this class of cruise ship. On Royal Caribbean's Oasis-class ships, guests can reserve three types of staterooms that offer a view of the Boardwalk. Balcony Boardwalk staterooms offer a sitting area (some with sofa bed), minibar and private balcony overlooking the amusements and exciting entertainment down on the Boardwalk. Boardwalk balcony staterooms are 182 square feet in size, with a 52 square foot private balcony (on Oasis of the Seas, the balcony is 47 square feet). These rooms are a very popular and attractively priced option. Depending on your stateroom location, there is the possibility of seeing the ocean and/or AquaTheater from the balcony. Similar to the Boardwalk View with Balcony rooms, the Boardwalk View rooms are like oceanview staterooms, but with a porthole instead of a balcony that overlooks the Boardwalk. These rooms offer convenient access to the Boardwalk neighborhood. The rooms are 187 square feet on Oasis of the Seas and 191 square feet on Allure of the Seas and Harmony of the Seas in size. The rooms feature two twin beds that convert to Royal King, boardwalk view, sitting area, and a private bathroom. Boardwalk View rooms will cost less than their balcony cousins, but still offer a way to see all the happenings on the Boardwalk. One of the most luxurious stateroom options on Oasis-class ships are the AquaTheater suites, which offer the perfect vantage point for entertainment in the AquaTheater. They also are immaculately furnished and feature private wrap-around balconies and more. The appeal of these staterooms are the top-of-the-line experience, along with the fantastic views. It goes without saying that a suite experience is the ultimate way to splurge and enjoy oneself on a cruise, and these AquaTheater suites are tough to beat. AquaTheater suites range in size, but expect a room around 650-823 square feet in size, with a private balcony that is around 600-803 square feet in size. Yes, this is a big room. Like all areas of a Royal Caribbean cruise ship, the Boardwalk offers many things to see and do as well. The centerpiece of Boardwalk is a one-of-a-kind carousel. Handcrafted from poplar wood especially for Royal Caribbean, the full-sized, traditional carousel feature 18 figures suspended from stainless steel poles showcasing a time-honored menagerie of animals such as zebras, giraffes and lions, alongside a variety of hand-painted horses including a princess horse and a crowned frog prince. The lead horse, customarily the fanciest horse of the carousel, is adorned with Royal Caribbean logos, while a single chariot serves as a stationary seat for two. The frame of the carousel has a red and golden yellow facade, turn-of-the-century artwork scenery panels, and LED lights that twinkle during the day and night. Many shows will take place in the AquaTheater, which is a remarkable outdoor venue that features a backdrop of the ocean across the horizon. Guests will find a variety of shows during the day and a dazzling ocean front theater with water and light shows, and professional aquatic acrobatic and synchronized swimming performances by night. The AquaTheater is a distinct high diving, acrobatic performance space introduced by Royal Caribbean with the Oasis class of ships, that feature two 10-meter high platforms and the hydraulic-floored pool, the largest and deepest freshwater pool at sea, below will serve as podiums for high-diving, hair-raising aerobatics that AquaTheater audiences have come to love. 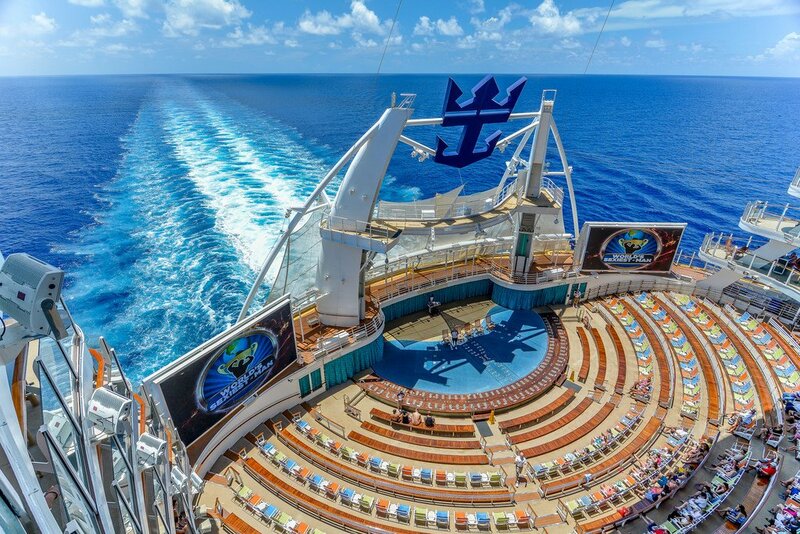 With seating for 600 theatergoers, the AquaTheater features some of the very best entertainment found on any Royal Caribbean ship, and the diving shows are not to be missed. There are two rock climbing walls that flank the AquaTheater, with multiple climbing routes that offer the right kind of challenge for climbers of all levels. The Boardwalk Arcade is another fun family option, where you can try your luck at ring toss, skeeball and other beloved carnival games. Of all the experiences available in the Boardwalk neighborhood, there are a few must-do activities we recommend all guests check out for themselves. 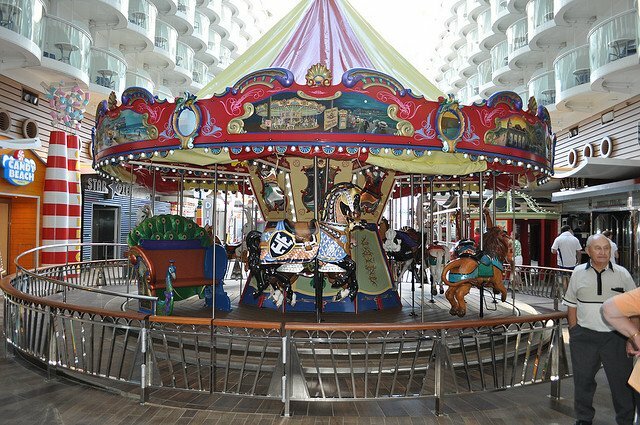 No cruise aboard an Oasis-class ship is complete without a ride (or three) on the Carousel. Regardless of age, guests of all ages can enjoy the classic nature of this attraction. Be sure to bring your camera, because there are bound to be terrific photo opportunities and ride during the evening and day to get completely different experiences. The evening AquaTheater diving and acrobatic shows are some of the best entertainment Royal Caribbean offers and should not be missed. The shows are awe inspiring athletic and artistic masterpieces that features incredible diving performances. There are three different shows featured in the evening across the Oasis-class ships. On three Oasis-class ships, Sabor is priced a la carte, and that means it is easy to drop in for arguably the best food on their menu, the guacamole. The guacamole at Sabor is authentic and incredibly tasty, and has been widely regarded by other Royal Caribbean fans as superior to most other guacamole they may have tried. Enjoy a serving of guacamole and chips either in the restaurant or take it to go to enjoy elsewhere. Regardless, you will find the perfect snack on your cruise. The Boardwalk is available on Royal Caribbean's Oasis of the Seas, Allure of the Seas, Harmony of the Seas and Symphony of the Seas. What do you enjoy about the Boardwalk? Share your thoughts in our comments!